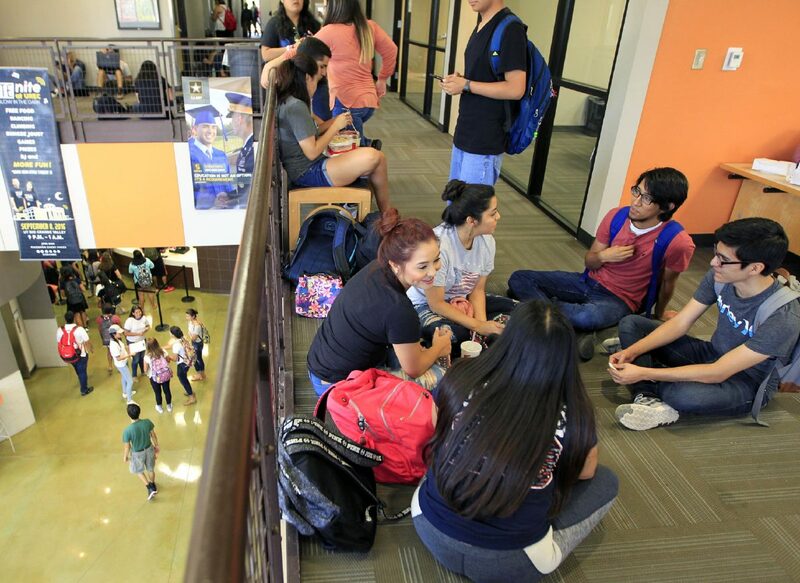 Clarissa Olivarez, center, talks with Jailene Lopez, bottom, as Lisa Castillo, behind center, talks with Abraham Lopez and Everardo Coronado during a break between classes Tuesday September 6, 2016 at the University of Texas Rio Grande Valley's campus in Edinburg. EDINBURG — Math and science students from the University of Texas Rio Grande Valley can soon apply for a scholarship established to help cover their last two years of college-related expenses. The National Science Foundation’s Robert Noyce Teacher Scholarship Program awarded the university’s UTeach RGV Program a total of $1,199,508 to cover scholarships over the next five years — these funds would be for students who are in good academic standing and who are interested in becoming high school teachers. The money will go toward fully funding the expenses of 15 students each year, 10 seniors and five juniors starting this fall. The program is called Supporting the Preparation of Science and Mathematics Teachers in Rural South Texas, and is co-directed by Christopher Smith, associate professor of chemistry, and Angela Chapman, assistant professor of science education. The UTeach program was created at UT-Austin about 20 years ago, Smith said, and was adopted at UTRGV’s legacy institutions UT-Pan American and UT-Brownsville in 2012. It has helped prepare 149 graduates, out of which about 80 percent have remained in the Valley. The program targets high-performing math and science students interested in teaching to try to encourage them to remain in the field and help meet the demand. It provides full tuition for juniors and seniors as well as money to cover other education-related expenses such as university fees and books. The scholarship amount is calculated based on the individual student’s needs, but Smith said a tentative cap has been set at $13,150 so far. “The idea is that each year we will have 10 seniors supported and five juniors and then for the juniors if they maintain their academic standard they get sort of rolled over and continue the scholarship in their senior year,” Smith said. The university has partnerships with nine school districts so far including McAllen, Edinburg, South Texas, Harlingen, Brownsville, Mission, Sharyland, San Benito and Los Fresnos, to give students field experience from the moment they join the program and until graduation. These partnerships have been developed over the years, he said, and the goal is to continue expanding the number of participating school districts in other areas of the Valley as UTRGV now covers the entire region. Program officials are working to develop an application that should be available by the end of June and students in those fields will be notified via email, advisers and other mediums.